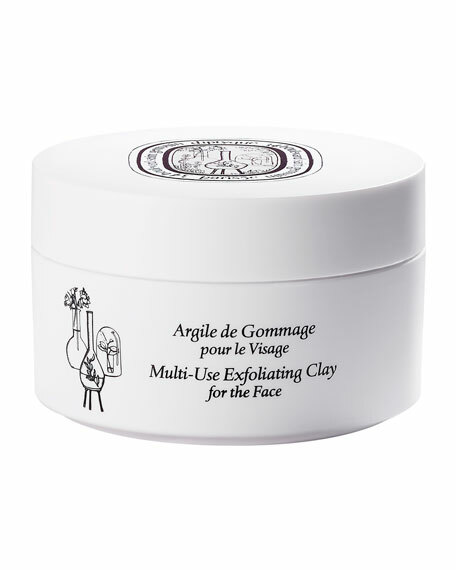 Diptyque Multi-Use Exfoliating Clay Mask, 4.7 OZ. DiptyqueMulti-Use Exfoliating Clay Mask, 4.7 OZ. New SKINCARE. A simple ritual of delicately scented products with surprising textures to stimulate and soothe the senses, all transforming upon contact with skin or water. MULTI-USE EXFOLIATING CLAY. Mask and/or exfoliant. A purifying, detoxifying treatment that leaves skin glowing. To use as a facial scrub, apply a small amount of the clay to clean, dampened skin. Massage lightly with fingertips using circular movements. Rinse thoroughly with warm water. To use as a mask, apply a generous amount to each side of clean, dry skin and spread over face in a thick layer. Let sit for 5-10 minutes then massage to boost exfoliating action. Rinse thoroughly with warm water.